As parents we can be very focused on teaching our children manners and appropriate behaviors – choosing the right words, using our “inside” voices, sharing, being kind to others. But somewhere along the way we forget that those very behaviors we are instilling in our children are ones that we should remember for ourselves. Please – As a leader we often have to ask employees to do things that they may not want to do or that come with little reward. Barking commands and handing down edicts may get action but it does little to engender trust, respect, and a higher level of engagement from your staff. A simple “Please” spoken with sincerity and recognition of what you are asking the person to do can make a big difference. Thank you – Employee surveys often cite acknowledgment for work done as something that is lacking in their current organization. Feeling valued and having your contributions known and recognized are important aspects of an employee’s satisfaction with their current work and supervisor. A leader who is willing to take a moment to say “Thank you” – again, sincerely – fosters goodwill and positive views about the work environment. It is easier to discover moments to say “Thank you” when you focus on catching people doing things right. Noticing the good around you, the successes, the best efforts opens you up to many opportunities, and to many opportunities to express your gratitude and acknowledge someone. While not everything we need to know we learned in kindergarten, getting back to some of those early lessons in behavior can pay huge dividends today. 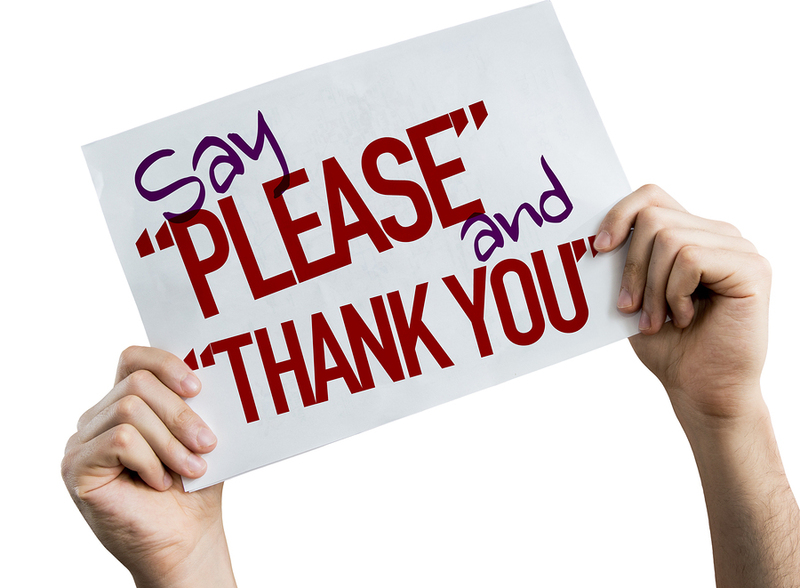 What opportunities are there for you to say “please,” “thank you,” or “I’m sorry” more often? To get back to basics and have greater impact, contact Robyn at rmcleod@chatsworthconsulting.com.